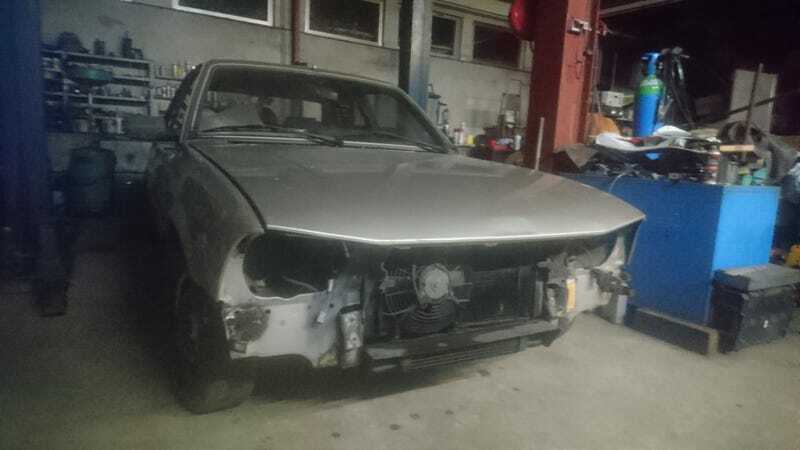 Now that the Bel Air is on it’s wheels again (not finished though), the Pajero has a working transmission, the parts 505 is stripped, the Mégane is ready for sale, and the Landcruiser is sold, it’s time to tackle another car that’s been sitting for a while. My dad bought this 505 2.5 turbo diesel about 10 years ago with the intent to fix it and make it his week-end driver. It had a very clean interior, was mechanically fine, sadly an auto, but whatever. The body was mostly rust free, but some panels have been resprayed and the others have bad clearcoat. It also had a small accident, bending the front bumper, it’s mounting points, and piercing the radiator. Now the radiator is important, because the auto 505s had special radiators, cooling the engine coolant and the trans fluid. We didn’t have one in stock and my dad never took it to get it recored. This missing piece has been the excuse to not fix the car for years now. A few weeks ago, I bought a parts car, 505 V6, manual trans. But for some unknown reason, it had a radiator from an auto. The transmission part was just not connected. Now that he didn’t have an excuse anymore, my dad decided to fix it, and we pushed it onto the lift this evening to start working on it. Naturally, the years of standing didn’t help, and it needs a bit more work now, bit it’s starting!